The Sheilings01263 715779work01603 870304fax Self-cateringBurnham Market is a beautiful coastal village, renowned for its shops and eateries. It is close to the sandy beaches at Holkham and Wells, and to the beautiful beach at Brancaster where seals can often be spotted on the sand or in the sea. The Sheilings offers single storey comfortable accommodation and it is just a short walk from the centre of the village and all its amenities. 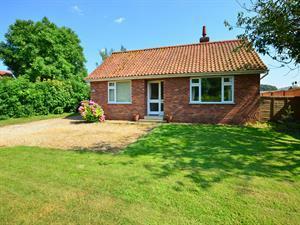 A bungalow just a short walk from the centre of Burnham Market. The Sheilings offers weekly bookings starting on Saturday. Burnham Market is a beautiful coastal village, renowned for its shops and eateries. It is close to the sandy beaches at Holkham and Wells, and to the beautiful beach at Brancaster where seals can often be spotted on the sand or in the sea. The Sheilings offers single storey comfortable accommodation and it is just a short walk from the centre of the village and all its amenities. From Norwich take the A1067, then the A148 turning off on B1355 to Burnham Market. As you enter village you come to Nelson Pub, turn left at this jct, go past village greens and past church. From King's Lynn - 23 miles Taxi or bus.